We live in an age where judging others has become the norm and mocking people for their mistakes has become a huge pastime. While some of us might do it unintentionally, others might fall into this out of ignorance or even arrogance. Calling ourselves the Ummah of Prophet Muhammad (pbuh) comes with certain responsibilities. One such responsibility is correcting people’s mistakes. While correcting the Bedouin and pointing out his mistakes, Prophet Muhammad (pbuh) did not speak rudely to him, tell him off or humiliate him in front of others. Rather, he allowed the man to finish what he was doing, was patient the whole while and made him understand why he was wrong, softening the Bedouin’s heart and cooling the rising tempers of his companions at the same time. How often have we softened others’ hearts with kind words while correcting their mistakes? This is a very important quality to develop while trying to correct people’s mistakes. More often than not, we tend to push our values and preach excessively without understanding why or what led that person to behave in such a manner. In the aforementioned hadeeth, we learn a mighty lesson. Prophet (pbuh) understood that jealousy run’s in a woman’s mind when she is given a dish prepared by her co-wife. He didn’t chide her for it nor did he yell at her in front of the other companions. He made her replace the broken dish with a new one. The matter was done and over with! 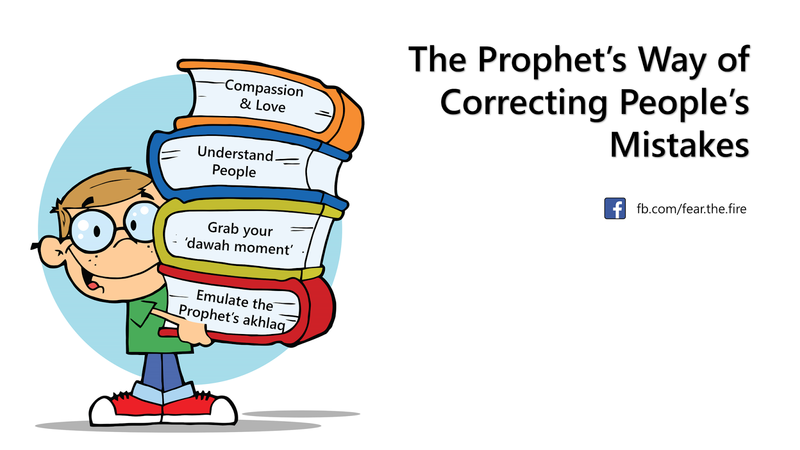 Did you notice how Prophet (pbuh) used a vague description “some” rather than calling names while correcting their mistaken believes? He also made it a moment to teach them that Islam is all about moderation and balance between dunya and akhira. Giving dawah is an obligation upon us Muslims. So, the next time you see someone making a mistake, a sister not fulfilling her duties in wearing the hijab modestly or someone gossiping, instead of shouting “astaghfirullah”, grab your ‘dawah moment’ and let them know what Islam says about certain things. But ensure that you do not force your belief and opinion on someone. More on this here. Allah has preserved the sunnah of Prophet Muhammad (pbuh) for centuries, so that it could reach us. There is a reason for this. We are supposed to make Prophet Muhammad (pbuh) our role model and emulate him in whatever we do. He (pbuh) used to smile often, so let’s remain chirpy and exude positive energy towards others. He (pbuh) was soft and kind when dealing with laymen and his companions. The Prophet (pbuh) did not allow extremism in any form. Let us be soft and kind to our own families and friends. Prophet Muhammad (pbuh) was extremely kind to Non-Muslims. He (pbuh) won people’s hearts with his character, leading to the rapid spread of Islam, so much so that even his staunchest enemies accepted Islam and died for the cause of Islam!